Sunforgettable Almost Clear is a tinted, weightless powder that provides long-lasting SPF 30 sun protection. 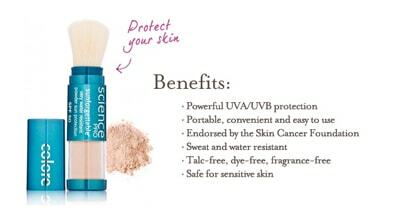 This brush-on mineral formula is free of dyes, chemicals, artificial colorants and odors, making it ideal for anyone and everyone - men, women, children, even people with rosacea or eczema! 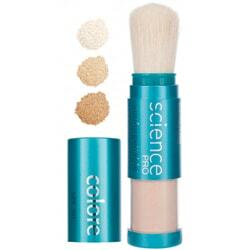 This powder will keep your skin cool and can even be applied and be effective on skin already reddened by the sun. It is effective after skin peels, laser resurfacing and most surgical procedures. It will not burn your eyes, rub off on your clothes or come off in water. Tan is ideal for darker skin tones.